Fans of our art workshops led by Felicia Stadelman will be pleased to know we will be screening her interview with French film director, Catherine Aventurier. 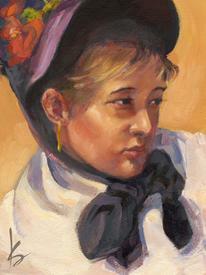 Aventurier took notice of a YouTube video of the Art Lecture Series, Through the Eyes of the Artist, and contacted Stadelman to see if she would be interested in participating in a documentary about the relationship between artists Mary Cassatt and Edgar Degas. Stadelman was flown to Paris for the interview and filming. The finished documentary has been translated with English subtitles and contains images and music intertwined with interviews with a psychiatrist, a well-known author, art historians, and actors portraying the artists. The product details the deep and sincere friendship between two colleagues—Mary Cassatt, the feminist, and Edgar Degas, the misogynist. This is not an art workshop. This free program is sponsored by the Stow-Munroe Falls Public Library. About the Speaker: Stadelman, inspired by her enthusiasm for art, has dedicated her career to sharing the fascinating details of the lives and works of some of our most recognized and influential artists.